The 24-Hour Mommy: Goodbye Tita Cory! For me, she's the original 24 Hour Mommy. From being a simple housewife, she metamorphosed into a strong icon of democracy. She made the whole nation her extended family. She was a mother not only to her five children but to all of us Filipinos. Most of the people who gave eulogies during the necrological mass yesterday spoke about her death as a time for her most awaited rest. I agree. She can take her rest now. 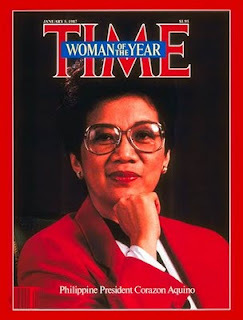 It is now time to meet her beloved Ninoy and Our Creator. I am thankful that her children willingly shared their mother to the whole nation. I hope and pray that, with Tita Cory gone, we can muster enough courage to uplift the democracy she fought hard for.